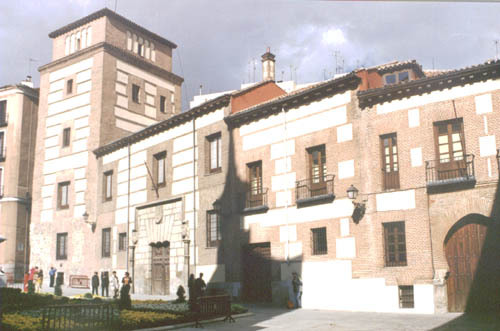 The Casa and Torre de los Lujanes in the Plaza de la Villa in the west of Madrid is among the oldest buildings in the city. The house and tower (Casa and Torre) actually date from different periods. The tower is the oldest structure. It dates from the early 15th century, while the house dates from the late 15th century. The family of Alvaro de Lujan commissioned the complex surrounding the original house in 1494. The present day name for the group of structures takes its name from this family. The properties remained within the family for some 200 years. The buildings were constructed in the Mudéjar style, which is a strongly Muslim-influenced style of architecture that came into being around the 12th century in Spain. The tower may have been home to King Francis I of France for a short while sometime after 1525. There is no real historical evidence to back this up, other than a persistent oral tradition. The French king was captured during the Battle of Pavia in 1525. He was imprisoned by Carlos V (Charles I of Spain), possibly in Torre de los Lujanes for a time. The tradition says that when the king of France refused to kneel or bow to the Spanish king to show respect, Carlos had the door to the tower lowered to the point where Francis I was forced to bend over, effectively bowing, in order to enter the building. The Spanish king waiting inside then considered the forced bowing action of entry by the French king to be him submitting and showing respect before the Spanish royal personage. Juan Gómez de Mora constructed the Casa de la Villa. 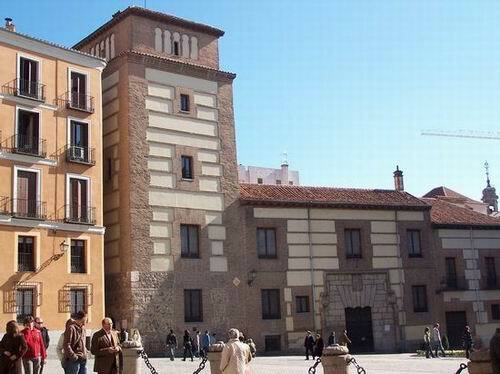 He was also the architect of the nearby Plaza Mayor, further to the east. The Casa was the old Ayuntamiento, or Town Hall, of Madrid. It is still used for official events on occasion, but the current Town Hall building is now in front of the Cibeles in the Palacio de Correos y Telecomunicaciones. The tower was one of the tallest buildings in Madrid for a long time. As such it was used as an optical telegraph station between Madrid and Aranjuez, to the south of the capital. Optical telegraph stations used line of sight to relay messages over long distances, usually by semaphore, or other visual signalling methods. The tower has also been home to many prestigious organisations over the years: the Royal Academy of Moral and Political Sciences; the Matritense Economic Society of Friends of the Country; and the Royal Academy of Sciences, Physical and Natural. The centre of Plaza de la Villa is dominated by a statue set in a colourful, flowery square of green that relieves the greyness of the plaza. The statue is that of Alvaro de Bazan. He was the Spanish Admiral who was in charge of the infamous Armada of 1588 that attempted to overrun England. The statue is a relatively recent addition to the plaza. It was added in 1980.